Pictures taken by Stenapa show considerable damage to trees in The Quill. Photo: Stenapa. Oranjestad – Nature on Sint Eustatius has been heavily affected by hurricane Irma that struck the island in the early morning of Wednesday 6 September. This becomes clear from information provided by Sint Eustatius National Parks Foundation (STENAPA). According to the STENAPA organization, most visible are the effects on land. During a preliminary nature damage assessment by STENAPA counted hundreds of uprooted trees and snapped trunks, but there is damage under water as well. 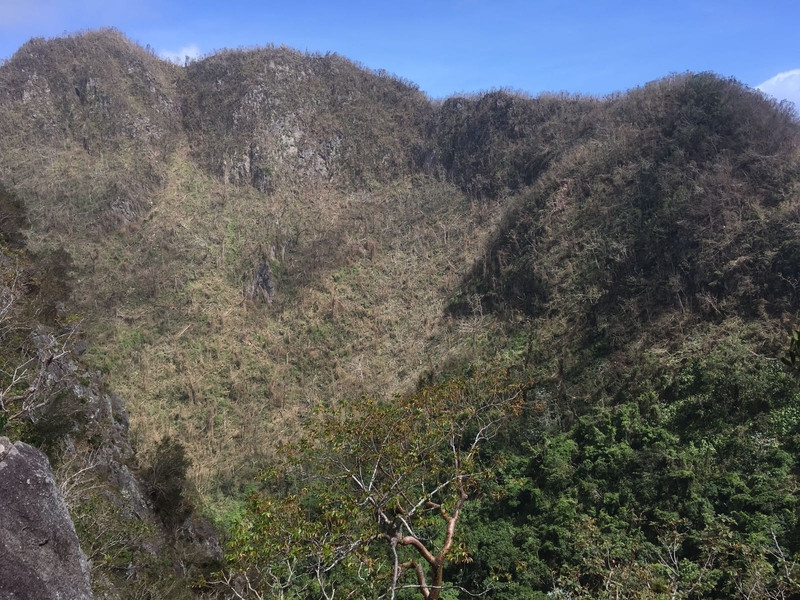 The quick scan shows that in The Quill National Park 80 to 90% of the trees on the outer Northwestern slope and the inner SoutEastern slope have lost their leaves. Due to this the Quill looks brown-greyish, instead of vibrant green. At least 20 trees were uprooted and fallen over the Main Quill trail and hundreds of limbs and branches on the ground. This means that hundreds of trees overall on the Quill are down and many more limbs and branches. The Southeast part of the crater is also affected. Outside the National Park STENAPA counted 217 visible trees down or snapped with a diameter of at least 1 meter. Of all the districts Oranjestad itself showed the most damage of 34 trees of which 12 trees had a diameter of 3 meter of more. Trees provide shade, stabilize the soil, provide food, provide shelter for wildlife, absorb carbon dioxide and release oxygen. Around 95% of the trees along the Caribbean cliff side in Lower Town, many of them old trees, lost their leaves. In the National Marine Park seven of the most important dive sites have weathered the storm relatively well. There is minor damage on the reef. The corals, hard and soft corals such as sea fans, retained their cover. Except for damage to mostly medium sized Giant Barrel Sponges the sites have remained their cover. Unfortunately the coral garden in Jenkins Bay (6m under water, 10 coral ladders) is gone. This coral garden is part of a EU funded project where STENAPA tries to grow, with other partners, Elkhorn and Staghorn coral fragments on tree like structures. The coral garden at Crooks Castle is still standing (5m under water, 4 coral ladders). As soon as the fragments are big enough they will be planted out on the seafloor. All the sand on the beaches on the Caribbean Sea coast (Orange Bay) has gone. Due to this sea turtles won’t be able to lay their nest on the short term. Conversely 1 to 2 meters sand was deposited on Zeelandia Beach on the Atlantic side. This beach is well-known as a nesting area for sea turtles. It is too early to say whether the extra sand has a negative effect on the already confirmed nests. In the Botanical Garden trees are down, including numerous branches and limbs. The shade house is destroyed and 2 of the 4 solar panels were blown off the roof of the visitors center. Due to this the drip system doesn’t function any more. STENAPA has submitted a report about the results of the preliminary nature damage assessment to the Public Entity of Sint Eustatius.